Our school dinners are freshly prepared every day in our kitchens. We run our own kitchen with the aim of providing good quality healthy meals at an affordable price. Children are given a good choice of meals and these can be ordered on the day if required. The cost for a dinner is £2.25 Lunch is provided free of charge for children in keystage one (Reception, Years 1 and 2). Each term we provide a lunch menu. 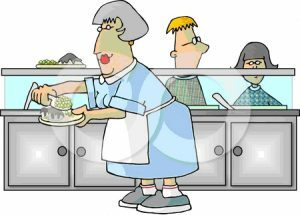 To ensure that children get their menu choice they can pre-order lunch in the morning via their teacher at registration. If you have any questions about school lunches you can contact the kitchen manager, Marie Henley, through the school office. If you think your child may have an entitlement to free school meals please contact the school office for further information and an application form. Alternatively, you can apply online via the school or Devon County Council website. The menu rotates on a three weekly basis.